I will have my solo exhibition on 18th till 26th May at sowale, Berlin-Prenzlauer Berg. Just a year ago, I had my very first solo exhibition at sowale. I am happy that I can have a great opportunity to work with them again for an exhibition. 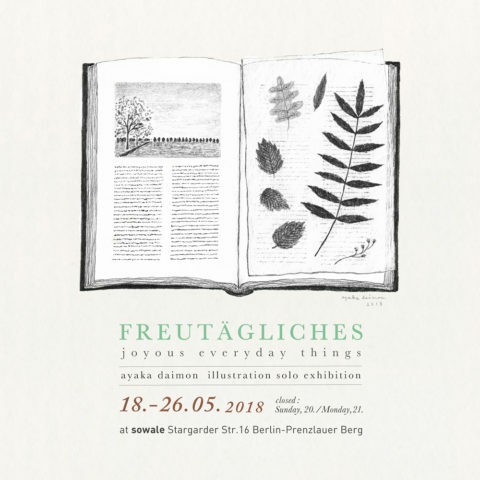 The title of this exhibition is „Freutägliches“. This word is actually a made-up word in German. It may be called “joyous everyday things” in English. One and a half years have already passed since I had moved to Berlin. And I got used to living in Berlin and I am really satisfied about the life. Why can I feel at ease even though I live in another country? – Because I have many „Freutägliches“ in my daily life. Through my Illustrations, I would like to exhibit a collection of my „Freutägliches“. 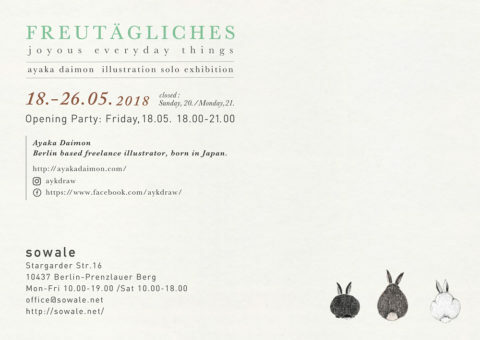 *My friends helped me a lot with the title of this exhibition. My new postcards, other items and moreover the original illustrations are going to be available.